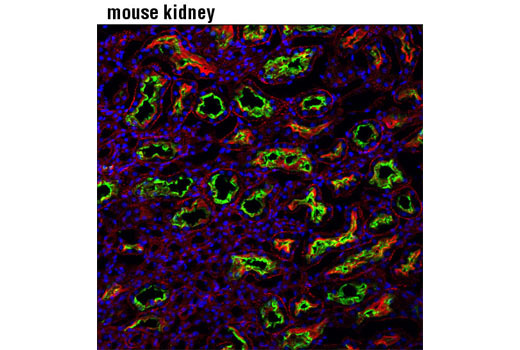 Confocal immunofluorescent analysis of mouse kidney using MRP4/ABCC4 (D2Q2O) Rabbit mAb (green). Actin filaments were labeled with DY-554 phalloidin (red). Blue pseudocolor = DRAQ5® #4084 (fluorescent DNA dye). 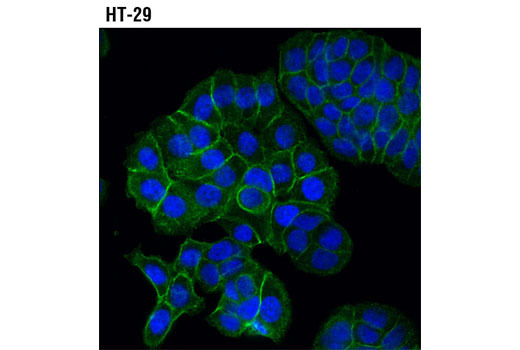 Confocal immunofluorescent analysis of HT-29 cells using MRP4/ABCC4 (D2Q2O) Rabbit mAb (green). Blue pseudocolor = DRAQ5® #4084 (fluorescent DNA dye). 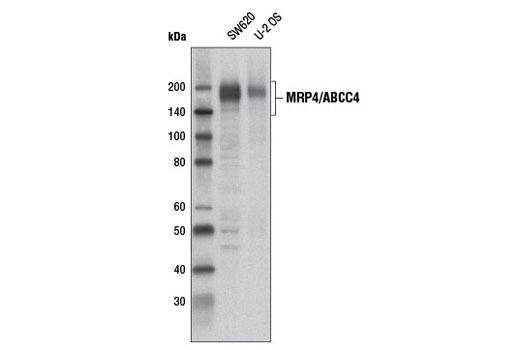 MRP4/ABCC4 (D2Q2O) Rabbit mAb recognizes endogenous levels of total ABCC4 protein. Monoclonal antibody is produced by immunizing animals with a synthetic peptide corresponding to residues surrounding Ala1023 of human ABCC4 protein. ABCC4 is a member of the ATP-binding Cassette (ABC) transporter family. ABC proteins transport various molecules across cellular membranes by utilizing the energy generated from ATP hydrolysis. There are seven subfamilies of ABC proteins: ABC1, MDR/TAP, MRP, ALD, OABP, GCN20, and White (1). ABCC4 belongs to the MRP subfamily, which is involved in multi-drug resistance, hence it is also named MRP4. ABCC4 is widely expressed in tissues including prostate, kidney proximal tubules, astrocytes and capillary endothelial cells of the brain, platelets, and many cancer cell lines (2-4). ABCC4 mediates efflux transport of a wide variety of endogenous and xenobiotic organic anionic compounds (5). The diversity of substrates determines the biological functions of ABCC4. It regulates cAMP levels in human leukemia cells, thereby controlling the proliferation and differentiation of leukemia cells (6). ABCC4 also enables COX deficient pancreatic cancer cells to obtain exogenous prostaglandins (7). Research studies have shown that ABCC4 expression is elevated in drug resistant cancer cells, which makes it a potential target for cancer therapy (8,9). ABCC4 localizes to both plasma membrane and intracellular membranous structures (10). Investigators have also implicated ABCC4 in the pathogenesis of Kawasaki disease, a childhood genetic disorder characterized by vasculitis (11). Nakanishi, T. Cancer Genomics Proteomics 4, 241-54. Kool, M. et al. (1997) Cancer Res 57, 3537-47. Lee, K. et al. (1998) Cancer Res 58, 2741-7. Nies, A.T. et al. (2004) Neuroscience 129, 349-60. Giacomini, K.M. et al. (2010) Nat Rev Drug Discov 9, 215-36. Copsel, S. et al. (2011) J Biol Chem 286, 6979-88. Omura, N. et al. (2010) Mol Cancer Res 8, 821-32. Bronger, H. et al. (2005) Cancer Res 65, 11419-28. Hagmann, W. et al. (2009) Pancreatology 9, 136-44. Rius, M. et al. (2008) J Pharmacol Exp Ther 324, 86-94. Khor, C.C. et al. (2011) J Med Genet 48, 467-72.